Cracked Tusk Keep is a fort located to the west of Falkreath. It is occupied by a group of Orc bandits led by Ghunzul. The fort has an exterior courtyard and two interior zones: Cracked Tusk Keep and Cracked Tusk Vaults. The first part of the fort serves the radiant quests, and the fort will be marked as cleared after you have killed the boss. The grounds have the typical wooden palisade surrounding the keep. The guards are Orc bandits and they make good use of the many elevated positions around the keep. The western tower ruin contains a semi-buried master-locked chest. The easiest way to access the chest is to climb up the rubble from outside of the wall. An apprentice-locked chest is located on the very top of the keep, between the two rear towers. Using the keep's series of ramps and lookout platforms, approach from the west and climb/jump up the rubble to the top. The keep's courtyard has several outbuildings designed for sustaining an army. From left to right around the courtyard is a smokehouse with a variety of meats being cured and various animal pelts, a small rest area containing a copy of The Code of Malacath, and then the main door to the keep. Across from the door is the fully equipped smithy, complete with a forge, workbench, grindstone and a tanning rack. There is a random sword[verification needed — Up to material?] on top of the workbench. Inside the smithy's shed is a table with a selection of poor quality armor and weapons and a copy of the Smithing skill book Light Armor Forging. There are three entrances into the keep. The first, and most direct, is the front door. The second is ideal for stealth based characters, a door with a level-dependent[verification needed] lock, directly south from the smithy and down a flight of stairs. This is the door to the cellar and can grant an advantage towards the guards in the main room. The third is a trapdoor, located on top of the southeast tower, which leads directly to the boss. Entering through the main door leads you right into the well-lit guards' area on two levels with at least two bandits; one on each level. A dresser just inside the entrance on the left has a potion of minor healing and a potion of minor stamina on top. Opposite the entrance is a cupboard holding two common books, a bottle of alto wine and a bottle of wine. There is a counter against the northeast wall with a haunch of raw venison, a joint of raw beef, a sliced goat cheese and two carrots on top. Hanging above from racks is a rabbit and pheasant. To the right is a barrel with a basket containing a cabbage and some red apples. To the left of the counter is a wooden door with stairs leading down to the cellar and Cracked Tusk Vaults. There are six unowned bed rolls on the floor. There are stairs against the rear wall leading up to the upper level, where a long table and benches are laid out with a baked potato, a portion of grilled leeks, a leg of goat roast, a tomato and a loaf of bread. There is a chair by the top of the stairs with an iron shield and random warhammer leaning against it. There is an end table along with several food sacks around the walls and a set of shelves against the southwest wall holding a random weapon, a random potion of healing, magicka or stamina, a medium coin purse, five common books including a copy of The Legend of Red Eagle and several food sacks. In the eastern corner there has been a cave-in. There is a wooden door to the southeast to the bandit leader's quarters. Through the door is a room with a fireplace on the right and a pair of leather boots on the hearth that you cannot interact with. There are food sacks on either side and a ladder to the left that leads to a trap door exit out onto one of the towers. Opposite this is an opening to Ghunzul's bedroom, where you will find him. There is an unowned double bed coming out from the northeast wall with a dresser on the right with a copy of the Cracked Tusk Vault key on top and a basket beside it containing two sheaves of wheat. To the left of the bed is a set of shelves holding a random helmet, a steel mace, a small coin purse, a leveled potion of healing, and nine common books. At the foot of the bed is an unlocked boss-level chest and in the corner a round table and chair with a copy of The Code of Malacath on top. Ghunzul also carries a copy of the Cracked Tusk Vault key. Through the door on the ground floor to the northwest is a passage that descends a flight of stairs. At the bottom is a cupboard holding only clutter, with a random pair of boots to the left. On your right is the room where you would arrive if entering through the novice-locked entrance south of the smithy. Beside the entrance is a long wooden table with an alchemy lab built in. On the table is a random potion or poison and dagger, while hanging above are two bunches of dried elves ear and three bunches of dried frost mirriam. To the right is a cupboard holding several ruined books, two empty random soul gems, a sprig of snowberries, a thistle branch, a random potion of healing and a food sack. Beside the cupboard is an end table with a basket of potatoes and a random pair of gauntlets on top. Opposite the table is a dresser containing clothes with a long bow, a quiver of iron arrows and a potion of minor stamina on top. There are a couple of barrels and sacks around the room and in the southwestern corner is a passage blocked by spears with an expert-locked cage on the wall, containing a button that activates the spears. The cage can be unlocked with the key taken from Ghunzul or lockpicked without it. Beyond the spears is a flight of stairs down to a wooden door leading to Cracked Tusk Vaults. There are no enemies within the vaults, but the vaults have suffered quite a bit of damage from cave-ins and there are still several traps that are armed and can cause damage to the unwary. There is a passage behind the door leading down to the southeast. In front of you is a counter with a random potion of healing and two empty random soul gems on top. Beside this is a basket containing a gourd. There are a number of food sacks and barrels of ingredients found throughout the vaults. At the bottom of the stairs is a room with spears blocking access. To the right is a button that lowers the spears. The room contains a dresser, cupboard and set of shelves holding a small coin purse, a random mace, an iron dagger, a copy of Lost Legends, a potion of minor healing and a random poison. There is also a broken table in the corner with a potion of minor stamina, a random potion, an empty petty soul gem and a filled random soul gem among the remains. Slightly further along the passage, on the left is another room, again with the spears and button. Inside this room is a set of shelves holding clutter with a fox pelt on top and a random shield leaning against it, a wooden bench with a copy of the Light Armor skill book Rislav The Righteous at one end and a random potion of healing at the other. There is an iron battleaxe on top of a couple of barrels and beside these a cupboard holding a set of iron armor, a random helmet and gauntlets. Further along the passage opens up in front of double sets of spears blocking the passage both horizontally and vertically. On the left is an unlocked chest and an iron helmet with a set of shelves that have been knocked over by a cave-in, knocking a random potion of magicka onto some more barrels. There are pillars with levers either side of the passage that activate the spears and giving access ahead and beyond these are three tripwires in a row along the central passage. These trigger poison dart traps that are easily avoided. To the left is a fourth tripwire that triggers a spike wall trap. To the right is an adept locked chest. At the end of the passage is a plinth with the shards of Mehrunes' Razor sitting on a weight-sensitive plate that also triggers a poison dart trap. Standing to the left when taking them and jumping back allows you to avoid damage. There is an iron ore vein located 150 feet due north of the keep. If the Amulet of the Moon quest directs you here, check to see if you have already visited this location. This location does not respawn, so if you have been here before, the Moon Amulet cannot spawn here and you cannot complete the quest. 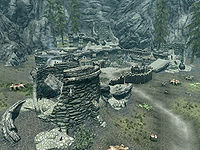 This issue has been addressed by version 2.1.0 of the Unofficial Skyrim Patch; the location will be forced to reset and anything stored here will be lost. Without the Unofficial Patch, you will need to reload a previous save to get a different location from Kharjo. This page was last modified on 8 April 2019, at 20:06.